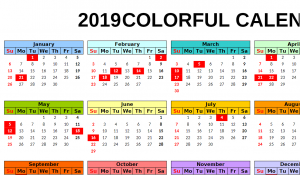 This comprehensive 2019 Calendar is a way for you to take control of the next 365 days and every year following them. This template displays every day of the year on one simple page for you to conveniently go through and highlight the most significant events you have planned for that specific month. All 12 months are listed at the top and are preceded by each day of that month in the corresponding column. Now you can keep track of every major event in your life with ease by downloading the file below! The 2019 Monthly Calendar is designed to take all of the pain and effort out of organizing your daily schedule. Start by clicking on the link at the bottom of this page to download the calendar. Start by entering your unique information and plans. Simply click on any cell containing the day in which you want to plan something and start typing in that information. The Monthly Calendar is meant to make your life simple and organize your daily schedule in one easy to read the overview. All you need to do is write down the important things you plan on attending. You can even enter the goals you want to accomplish by a certain date; it’s all ready and waiting for you! After you have finished entering your important dates and have customized the calendar to your liking, you can print the document to carry around your yearly overview everywhere you go. Simply press the “File” tab at the top and select the “Print” option.